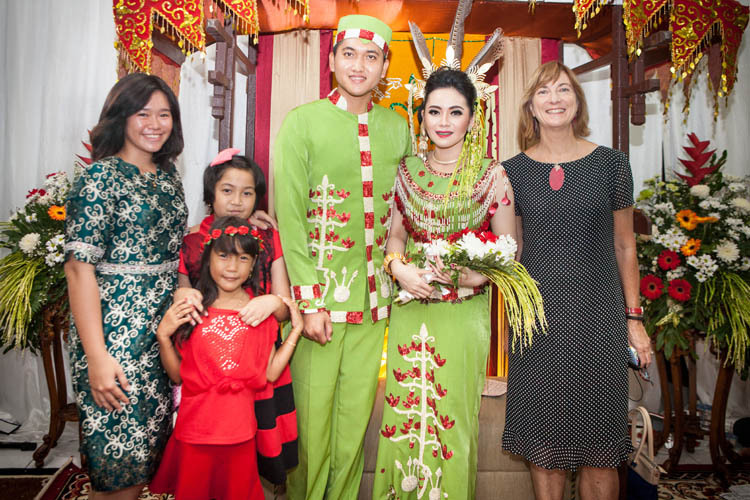 We’ve been to a fair number of wedding receptions over the past year in Kalimantan. 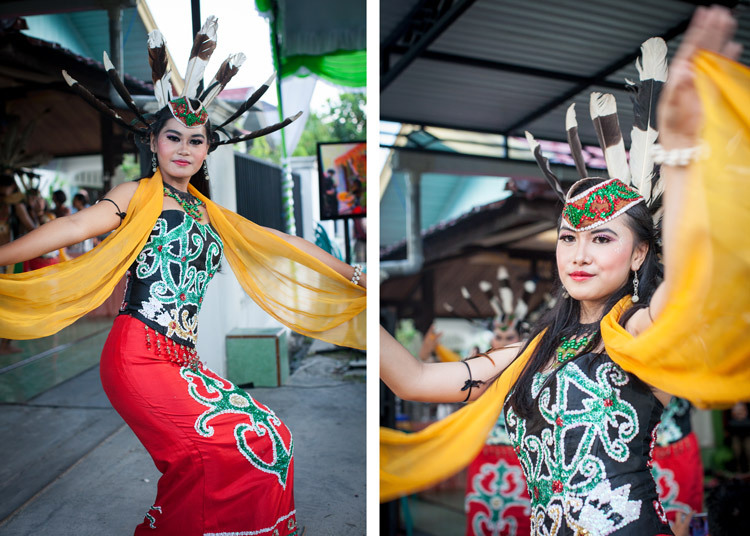 Actually, Karen counts 11 that she has attended – Dayak, Banjar, Javanese (she’s a couple ahead of me…) – and we’ve been invited to even more. Interestingly, in no case have we met the Happy Couple before showing up at their wedding. In a reversal of usual practice in Australia, the wedding reception is open to almost anyone who has some kind of connection to the wedding families (one wedding we attended had around 2000 guests), but the actual ceremony is usually a relatively private affair, attended only by family and close friends. 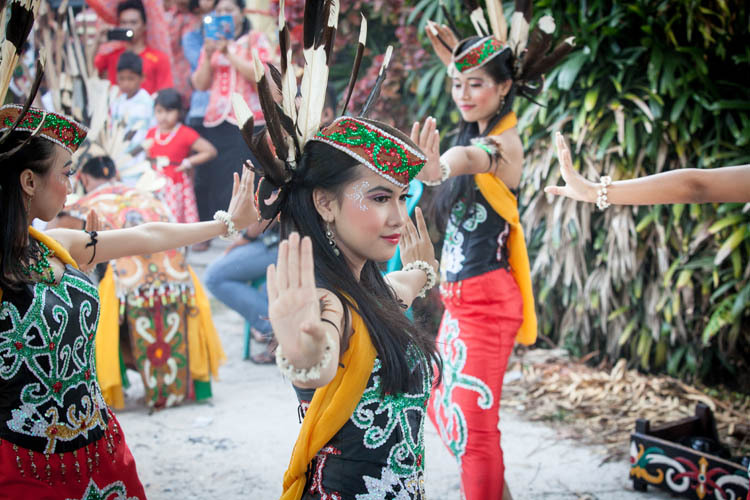 So we were delighted when our friend Lelie asked us to accompany her and her mother to the traditional Dayak wedding of two old friends of hers friends in Palangkaraya one recent evening. Lelie went to high school with Mensie (Mensie Martha Lovianie) and Alben (Briptu Alben Olandi Lambung). 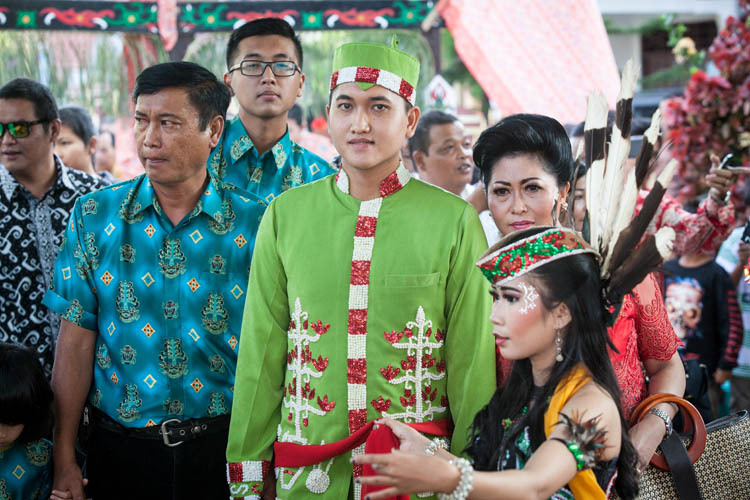 Although held in the capital city of the province, it was conducted as if it was held in a village, and as if the groom Alben was coming from another village. So, first the warriors of the village assemble and greet each other. While awaiting the groom’s arrival, there’s time to make some wardrobe adjustments. 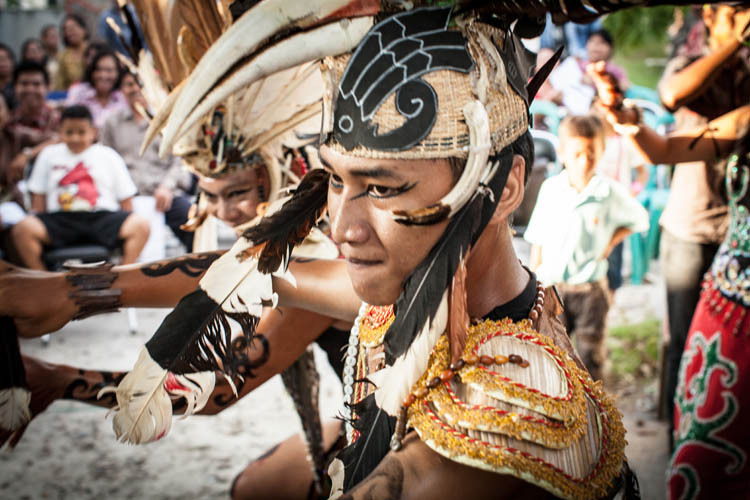 Note the hornbill skulls and feathers in the headdresses. There’s time also to limber up and practice a few dance moves with an attentive and proud teacher. Soon everyone is ready. The gong orchestra is playing, and everyone looks down the road for the groom. Then the groom arrives, flanked by his parents and an entourage of family members. But entry through the gate to the village is blocked (by some magic but flimsy-looking strings with flowers suspended from them) and, more convincingly, by a fierce-looking warrior in full war regalia, armed, poised and ready to fight. This is the beginning of the Lawang Sakepeng ceremony. 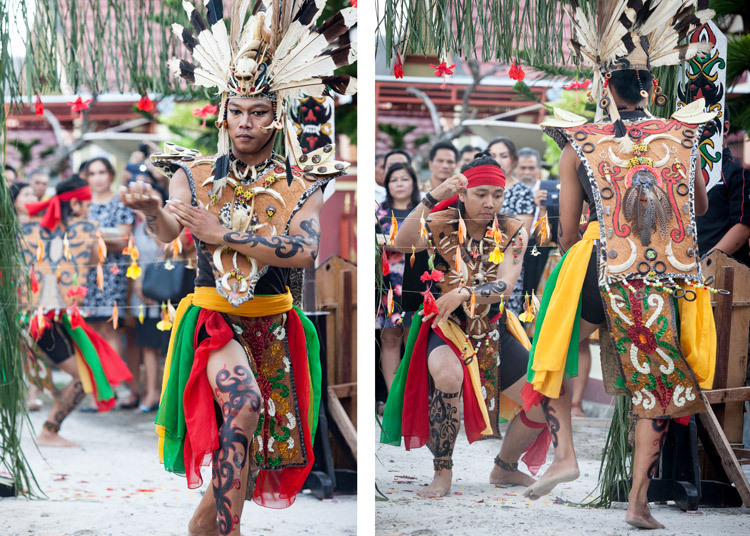 A male visitor to the village must prove his worthiness by fighting and defeating a local warrior at the gate. Only then will he be welcomed in – assuming that he is still alive and standing up. Nowadays it is all ritualised; the arrivee can nominate someone to fight on his behalf (presumably a better pugilist), and the fighting is a stylised dance, with no actual contact between the two ‘combatants’. They circle around on either side of the entrance gate, gradually working in closer to each other, and to the magical strings that separate them. The music from the gong orchestra gets louder and faster, and the onlookers start calling out encouragement and cheering any impressive moves. Then they engage in the hand-to-hand battle (without actually touching each other! 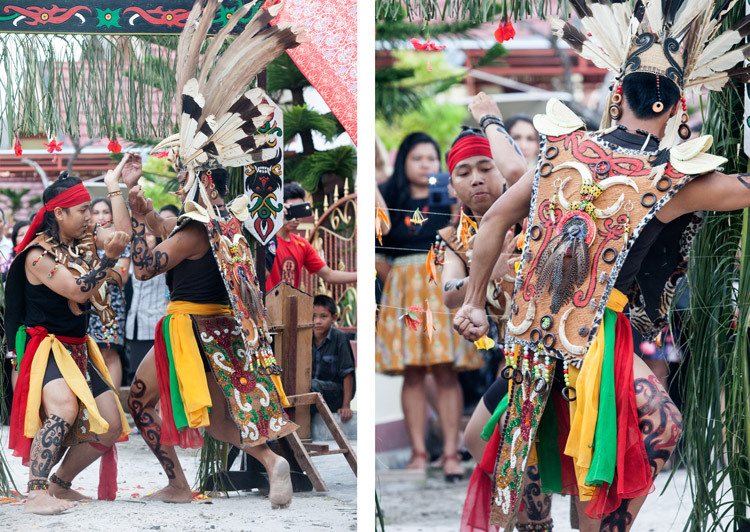 ), in the course of which the strings are torn down, the two fighters swap sides and the visitor, now proven to be a good fighter (or at least to have one on his staff as his ‘best man’) is admitted and welcomed to the village. 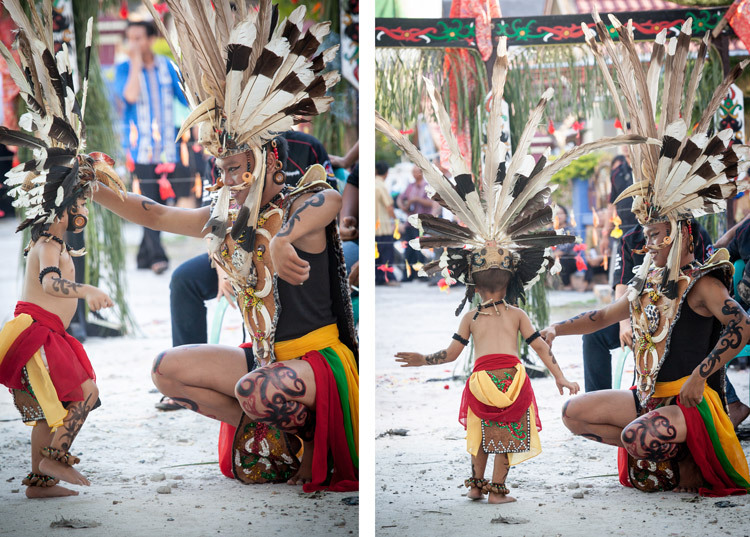 A dance is performed to welcome and honour the visitor and his family. Having made it through the initial challenge, they are now treated with great courtesy and respect. Then, down to business. The bride’s father asks: “Well, why have you come here?” And the groom (perhaps a little sheepishly) replies that he’s come to take a bride. And so begins the process known as Pengantin Bayangan. Attendants come outside a locate an unmarried girl, seemingly at random, from amongst the guests and bring her inside. “Is this the one?” the groom is asked. He replies that no, she’s not the one. She’s not the right height, or the nose is wrong, or some such discrepancy. He apologises to her for embarrassing her in front of so many people, and gives her a gift of money. And the (no doubt relieved) girl is led back outside, and another is brought in for the same examination. This whole process was repeated three times, and caused much hilarity. 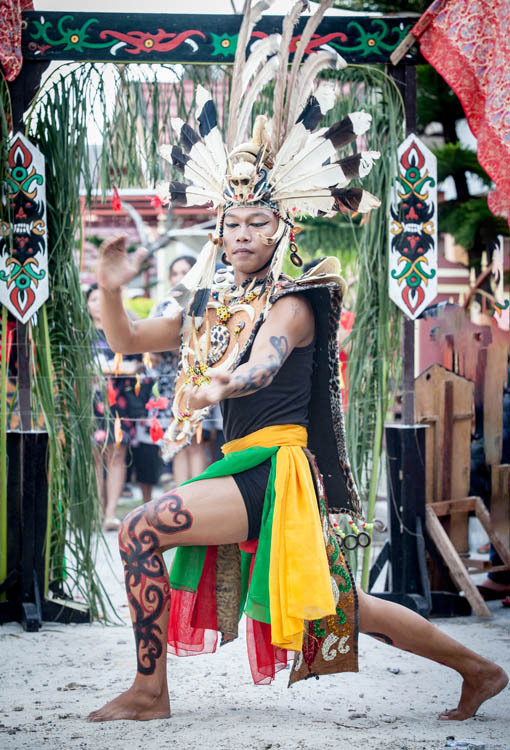 We wished that we could have understood all of the exchanges going on (in Dayak Ngaju language, not Bahasa Indonesia) at this point. 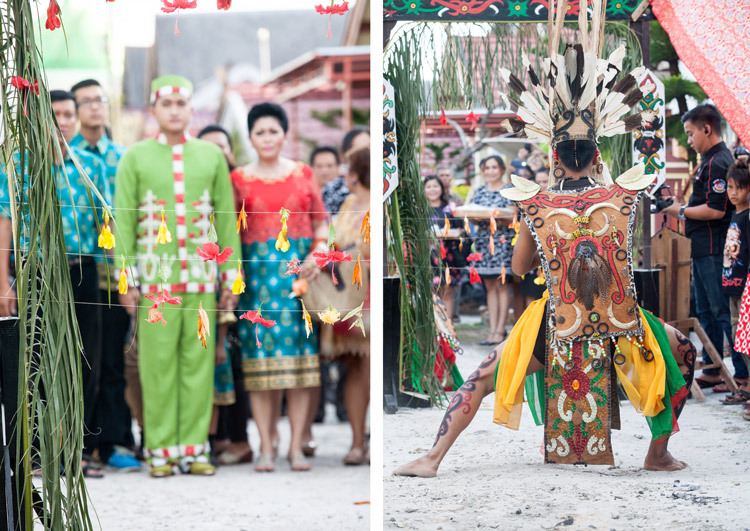 Meanwhile, dancers helped the groom look for his bride-to-be, and entertained the small gathering of guests outside. After a few errors, the ‘right’ girl is presented to the groom, who confirms that she is indeed Ms Right, and there are exchanges of vows and much celebration. No-one could tell us what would have happened if he chose the wrong fiancé, or if he rejected the right one – or if she rejected him at this point. They just looked horrified, and said that that simply doesn’t happen! It mustn’t actually have been too difficult for him to make the right selection, as his fiancé was wearing a matching outfit to his. More celebratory dancing, and then the warriors, reassured that they would not be called upon to fight, retired for the evening. (By this time the little warrior had already disrobed and disappeared. It might have been past his bedtime). 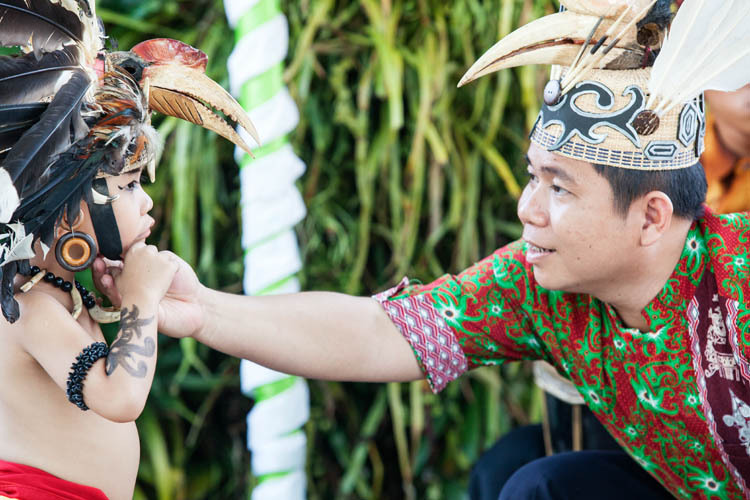 The bride is now introduced to all of the members of the groom’s family – a process known as Pakaja Manantu. The next part of the ceremony was really interesting, and VERY different (and I have no photos…) Both families are active members of the Kristen (Protestant) Church. So, when the traditional ceremonies were over, a minister in conventional church attire presided over prayers, a sermon, and a number of hymns that we all sang from the hymn-sheets that were handed out. We sang Di Hatiku, ya Yesus (“In my heart, O Jesus”), Tiap langkahku (“My every step”), and Keluarga hidup indah (“Family life is beautiful”), amongst others. So then it was time for the obligatory series of group photographic portraits, a delicious buffet dinner – and then everyone went home. Sudah makan, pulang. 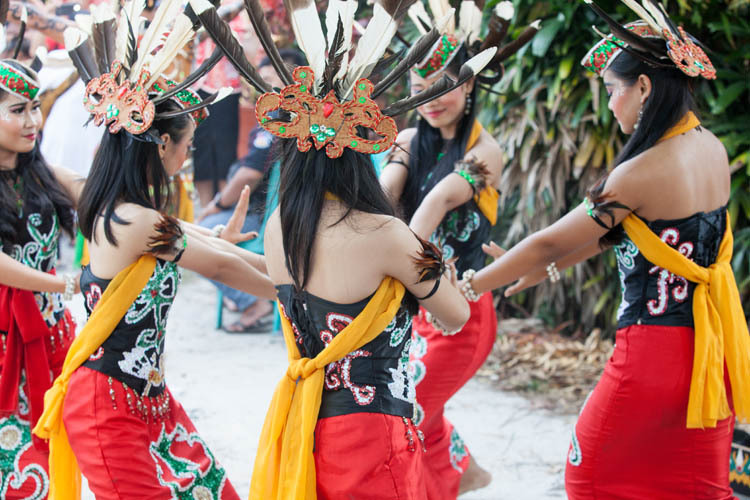 This entry was posted in Indonesia and tagged Central Kalimantan, Dayak Ngaju, Kalimantan Tengah, Lawang Sakepang, Palangkaraya, weddings. Bookmark the permalink. 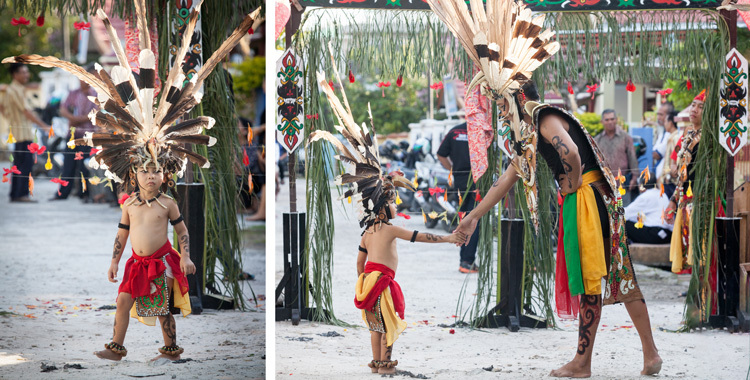 Hi John Thanks for your tips re travelling around Kalimantan with my family earlier this year. We decided not to try and drive around Kalimantan after doing the boat trip into Tanjung Putin National Park but flew to Semarang and did a train tour around Java most of our time in Jogjakarta where we did all the tourist things Borobodur, Prambanan, white water rafting, cave tubing and caught up with our Indonesian friends who live in Jogja. Unfortunately our local schools have stopped teaching Indonesian which was one of the main reasons for the trip. We nearly cancelled the trip because of the fires many other people did before us which is a shame for the tourist industry which profits from the natural environment. We had a wonderful trip and look forward to returning someday.